The storied blues highway running from the Mississippi Delta to the North is not a one-way road, as Adam Gussow can attest. A native of New York, Gussow’s academic pursuits landed him at the University of Mississippi, where he is a tenured professor currently teaching a class in blues literature. However, it’s not the 54-year-old’s master’s and doctorate degrees in English but rather his talent as one of today’s most respected blues harmonica players that made that reverse journey unusual. Having completed his first graduate-school stint at Columbia University, Gussow “went to Europe with a backpack and played on the streets. 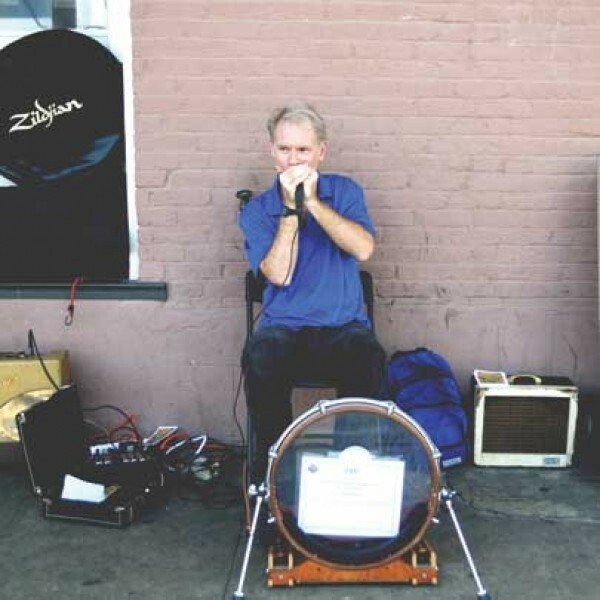 It turned my life in a different direction.” He returned to New York after a few years and continued his street playing, and while wandering one day he came across Sterling Magee. “It was my single most transforming moment,” Gussow says of the 1986 encounter with the elderly black guitarist known as Mister Satan, who held court on the streets of central Harlem as a one-man band. “He agreed to let me sit in with him, and I ended up playing with him each afternoon from 1 p.m. to 5 p.m. for a small crowd of mostly older black friends of his. Mr. Satan’s health problems have limited the pair’s performances after years of worldwide touring, and Gussow now mostly performs solo. “I never intended to be a one-man band,” he says of his original performing approach with his own percussion setup of a modified snare drum and kick pedal. “I wanted something more upbeat, a homemade element, and I got that from Mister Satan.” Gussow also does occasional shows with an Ole Miss colleague as The Blues Doctors. Friday, Nov. 16, 10 p.m.
Saturday, Nov. 17, 2-4 p.m.